Denton Corker Marshall Pty Ltd.
G.James has been working towards readiness to install the facade since winning the job last year. Recently G.James has been conducting tests using full scale mockups of sections of the façade to test both the appearance and function of the façade. The visual mockup stands 7.6 metres tall and 6.8m metres wide, each panel is 3.8 x 1.4 metres & weighs approximately 290kg. The aluminium screens for each panel weigh an additional ~90kg. The completed façade will be somewhat larger than our mockup – standing a full 14 stories tall. The visual mockup is for testing the appearance only – the actual facade (as well as the prototype for engineering tests) uses extrusions purpose made for the UTS project – around 30 new extrusion dies have been made to produce the extrusions for the this project. What do we do with the mockup after we’re finished? The visual mockup will remain on site until the mockup rig is needed for a few project. G.James typically creates a similar mockup for a new project every couple of months. G.James has also created a prototype on our engineering test rig to carry out a range of engineering tests. The test setup is a sealed chamber, with the external side of the facade mockup covering the ‘open’ side. The chamber contains jets to spray water, and pumps in/out air to increase or decrease the pressure in the chamber. The tests conducted measure the performance of the facade under both positive and negative pressures, as well as against the penetration of water. This test measures deflection at various points of the facade using potentiometers fixed to a frame parallel to the internal face of the facade. The deflection is measured under both positive and negative static pressures, across a range up to the test maximums. These pressures simulate the loading the facade will receive from wind. The pressures used for the test differ from project to project, and are determined with a site analysis by engineers. Deflection must stay within certain bounds to meet Australian standards – though these vary on the exact makeup of the facade. In the photograph to the right the deflection of the glass in a structural test results in distortion of the reflection in the glass (comparison against neutral pressure below). Air infiltration rate measures the amount of air penetrating the facade at a given pressure. This is necessary to determine air conditioning requirements for the building – the amount of air infiltration has a large effect on the efficiency of the building. The amount of air infiltration is measured by pressurizing the chamber, whilst a plate with a hole of known size is fitted in the chamber. The rate of air flow out of the pressurized chamber is then measured. The facade face is then completely sealed off with plastic, and the flow of air is re-measured. The difference between the two measurements is the amount of air that was penetrating the facade. This test carried out with both negative and positive pressures. The rate of air infiltration must be within certain bounds to meet Australian standards. Water penetration tests spray water onto the surface of the facade at a rate of 3L/m2/minute. Tests are conducted with a range of constant pressures applied to the chamber, and also with a range cyclic pressures as the water is sprayed. Water penetration is not quantitatively measured, the cause of any leaks found must be rectified. 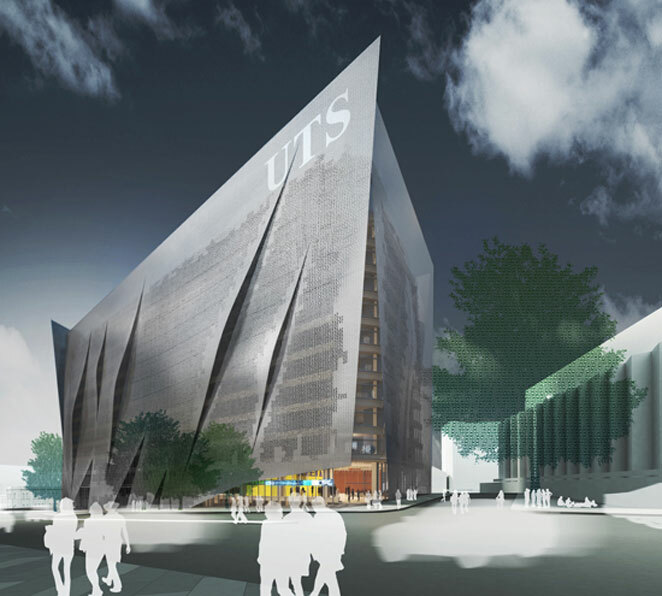 G.James is anticipating starting on site at UTS Broadway in the first quarter of 2013. This entry was posted in Facades and tagged Curtain Walls, Design Engineering, Louvres and Sunblades, Nata Testing, sun shades. Bookmark the permalink.